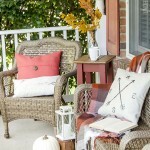 Many of you have figured out by now that I am totally infatuated with neutral fall decor…all you have to do is look back over the last month of blog posts and you’ll find a pattern! 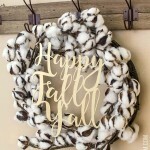 Even though my house is totally decorated for autumn, I have almost no orange, yellow, or red worked into my seasonal decor. I don’t have anything against those colors, but I much prefer softer colors and neutral and natural elements for this season. 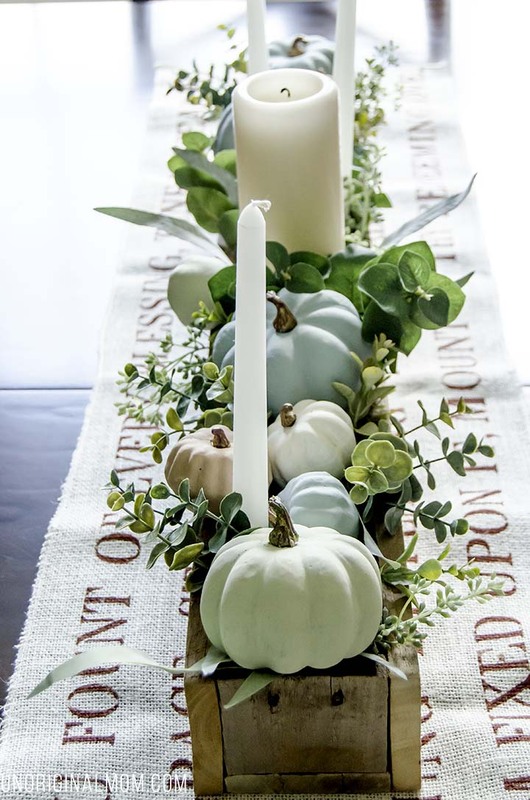 I started pinning away all kinds of autumn decor inspiration in August, and I even rounded up 10 absolutely beautiful neutral fall tablescapes last month – then I got to work creating my own! 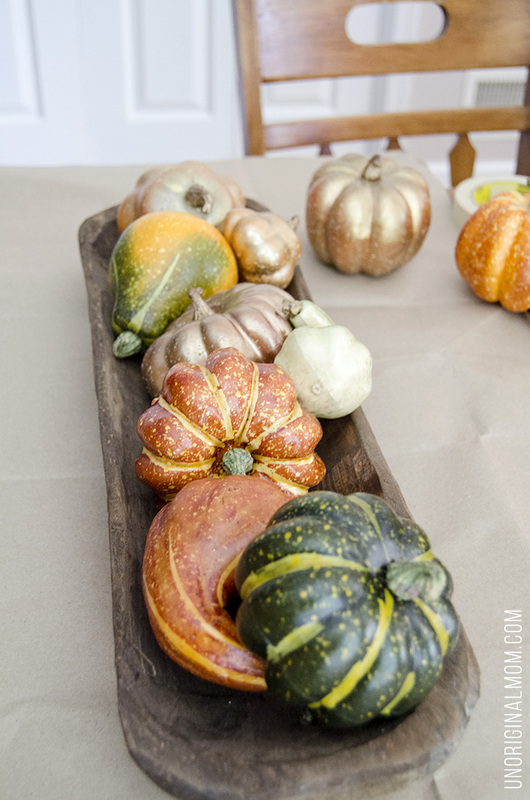 First of all, I fell head over heels for these chalk painted pumpkins from The Casual Craftlette. The colors along with the matte chalk paint texture are just so pretty! 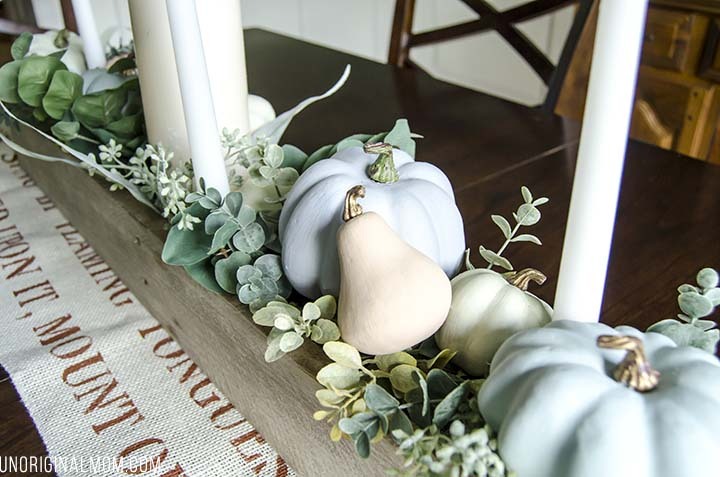 I had a bunch of pretty ugly faux pumpkins that I’d bought from Michael’s on super sale at the end of the season a year or so ago, and they were the perfect candidates for a chalk paint makeover. DecoArt was kind enough to send me some Americana Decor Chalky Finish Paint to use (I used it before on a dresser makeover and really liked it!) 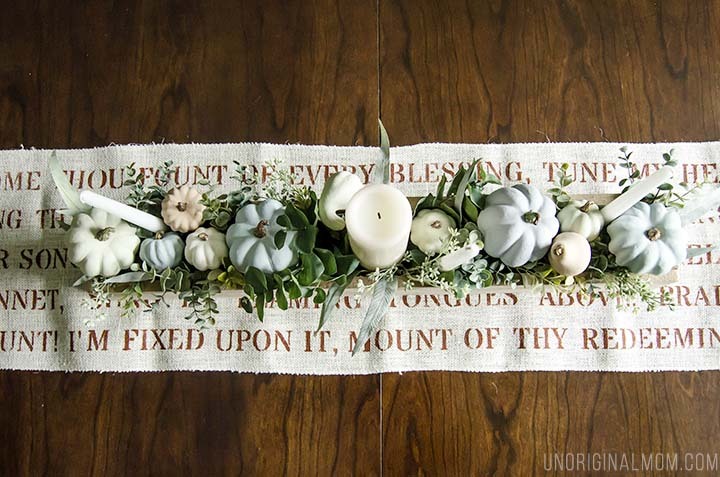 – I used the colors Vintage, Yesteryear, Heirloom, Revive, and Lace on my faux pumpkins and gourds. I wasn’t quite prepared for how long it would take me to paint all these little pumpkins. Even though I didn’t have to prime the surfaces – chalk paint sticks well to just about anything – it took a good 3-4 coats to get the coverage I wanted. Not to mention I could only paint half of each pumpkin at a time so that there was a dry surface for the pumpkin to rest on. So it took me a few separate afternoons of painting a coat, letting it dry for 20 minutes, painting another coat, letting it dry, etc. It wasn’t difficult, just kind of time consuming. But it did give me an excuse to watch a few episodes of Fixer Upper, so I didn’t complain ;-) And it was SO worth it – look how beautifully they turned out! 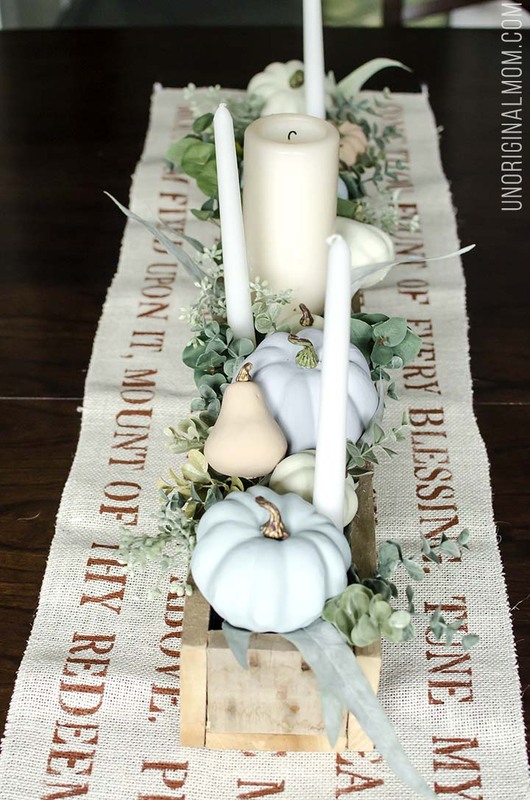 I decided to use some of my chalk paint pumpkins in my Pallet Box Centerpiece to create a tablescape for our dining room. I use this pallet box almost all year long – it’s so easy and fun to fill it up with different things for each season! Last fall I used cedar boughs, real mini pumpkins, pinecones, and candles for a Thanksgiving centerpiece, and then at Christmas I just swapped the pumpkins for some ornaments. 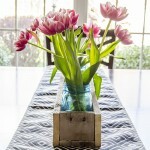 This past spring I filled it with aqua mason jars and tulips. 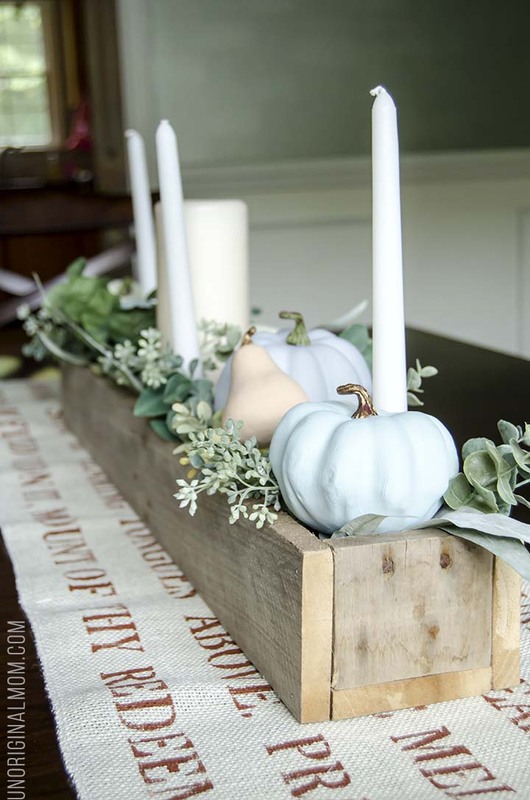 You can find a tutorial to build your own simple pallet box centerpiece here! For this version of my pallet box centerpiece, I used some floral foam in the bottom to secure the candles and then started sticking various faux greens from Michael’s into the foam to cover it up. Then I laid the pumpkins on top. I took me about half an hour to put it together – so easy! And it looks so pretty with my “Come Thou Fount” freezer paper stenciled table runner that I made last year! From a practical standpoint, I love that this tablescape is all contained in the pallet box, which makes it easy to pick up and move to put the leaf in the table, add a tablecloth, etc. I usually take a centerpiece to my grandmother’s house for Thanksgiving dinner, and I can already check that off my list! I’ll just take this one along with us. 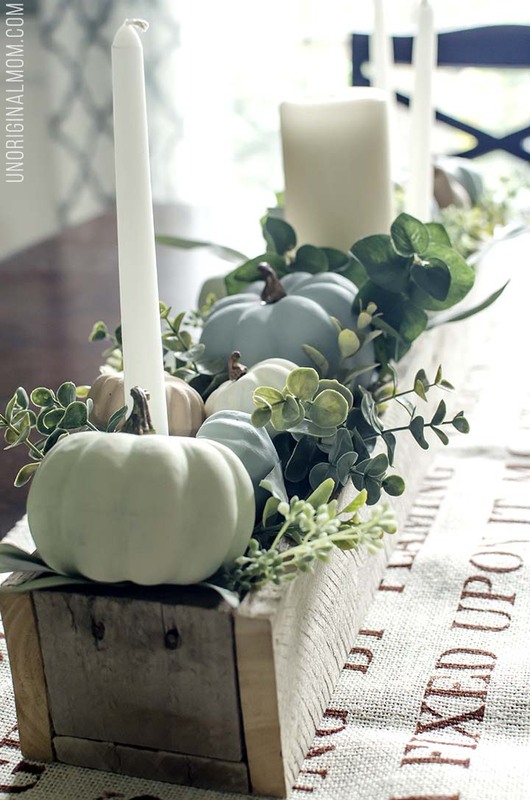 And the best part is, these chalk pumpkins and faux greens will look exactly the same a year from now…so I can use them in my fall decor year after year. 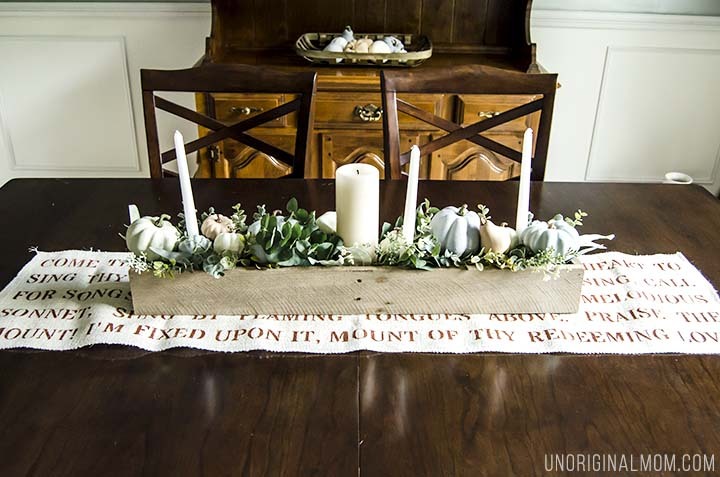 And as much as I love this centerpiece, I’m already starting to think ahead to how I’ll fill up my pallet box for a Christmas centerpiece this year :-) #lifeofablogger Do you have any ideas for me? Thanks to DecoArt for providing product for this post. As always, all thoughts and opinions expressed are 100% my own. great idea and great job! 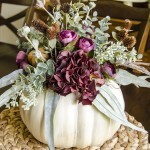 i love the colors you chose…i have a very old box similar to yours which i use for a centerpiece and i just love it…. I just bought some similar pumpkins at Target- and I have just the box- which I use on my counter at Christmas! Now it’s coming out for Fall, thanks to you! Perfect!! Sounds like it will be beautiful! Great job! So nice to see creative ideas for all seasons. Love the idea of using non-conventional colors to add interest in unexpected ways! Also love the idea of using same container for different seasons. What type of faux florals are these?? Do you happen to remember?? They were all from the fall florals section at Michael’s…that’s about all I know, sorry!